Lawmakers and food-safety advocates are pressing the Food and Drug Administration to quit dragging its feet on finalizing rules that retailers must follow for letting people know when food has been recalled—rules Congress intended to have been in place years ago. The Food Safety Modernization Act (Public Law 111-353), also known as FSMA, was signed into law by President Barack Obamain 2011. The FDA’s failure since then to develop the final rules requiring in-store recall notifications has caused concern from consumer advocates and lawmakers, who say better notices could cut down on the number of food-borne illnesses. “It should not take more than eight years for the FDA to ensure grocery stores post this vital information in their stores,” DeLauro said in a statement. The FSMA gave the FDA a one-year deadline to “publish a list of acceptable conspicuous locations and manners” for retailers.There were 7,420 food recalls in fiscal 2018, including 831 that were classified as the highest risk, according to the FDA. Food recalls also recently gained national attention after an E. coli outbreak last year linked to romaine lettuce, which sickened 43 people in 12 states. Following the lettuce incident, Sen. Kirsten Gillibrand (D-N.Y.)sent a letter in December to FDA Commissioner Scott Gottlieb asking about the timeline for completion of the “Grocery Store Notification” and “Consumer Notification” provisions of the FSMA. “These proactive actions would help make consumers aware if they had purchased an unsafe product without obligating them to actively monitor government recall notification websites or be fortunate to have learned about the recall from news reports,” Gillibrand said in the letter. “Recalls such as the one this summer for a popular children’s cereal could be more effective, and if parents were alerted that the unopened box of cereal in their pantry should not be eaten, they could take action to keep their kids safe,” she wrote. Boxes of Kellogg’s Honey Smacks cereal were recalled over salmonella fears in June. The FDA said it had taken some preliminary steps by issuing agency guidance for retailers but gave no indication of when it would implement the final regulation, the agency said in a response letter March 13 obtained by Bloomberg Government. “We’ll use all of our tools to carry through on this commitment and we will be sure to keep you updated on our progress,” said the letter. The FDA declined to comment beyond what was in the letter. In the letter, the agency said it had to prioritize other rules mandated by FSMA due to a court case and is still working to implement them. Once those rules are finalized the agency can “broaden our focus to other FSMA policy matters,” the FDA said. Most product recalls are issued voluntarily by the food manufacturer. Under FSMA rules, FDA can force recalls in certain cases where there is a major public health risk. Retailers are responsible for getting the recalled product off the shelves as soon as possible, under the direction of the agency and manufacturers. However, it isn’t mandatory for grocery stores to post food recalls or notify customers of products that need to be or have already been pulled off the shelves. Some grocery store chains choose to post voluntarily. Making it mandatory for grocers to post publicly “is an important part of the law that seems to have fallen by the wayside in the meantime,” said Sarah Sorscher, deputy director of regulatory affairs at the Center for Science in the Public Interest. “All the agency has to do is to make it a priority and quit coming up with excuses,” said Food and Water Watch’s Corbo. The delay of the grocery notification rule could be blamed in part due to the court case, Corbo said. Nonetheless, the FDA “used the same excuse for not getting the proposed rule out on laboratory accreditation,” he said. Under the FSMA, grocery store chains with 15 or more locations are supposed to display recall notices within 24 hours of their release and keep them posted for 14 days. Additionally, it requires grocery stores to display notifications where shoppers can see them, including at the register, at the shelf where a recalled product was stocked — approaches that grocer advocates say are limiting to the shopper —or they can use targeted outreach based on customer loyalty program data. Grocers say the law as written may not allow for the most useful notifications to be used to get the word out. Consumers today use many different channels to receive information and the FSMA statute “was limiting and prescriptive to paper-based recall notices,” said Dr. Hilary Thesmar, vice president of food safety programs at the Food Marketing Institute, which represents food retailers. “It is not an issue about being mandatory—it is an issue about being effective communication and reaching the consumer,” Thesmar said in an interview. 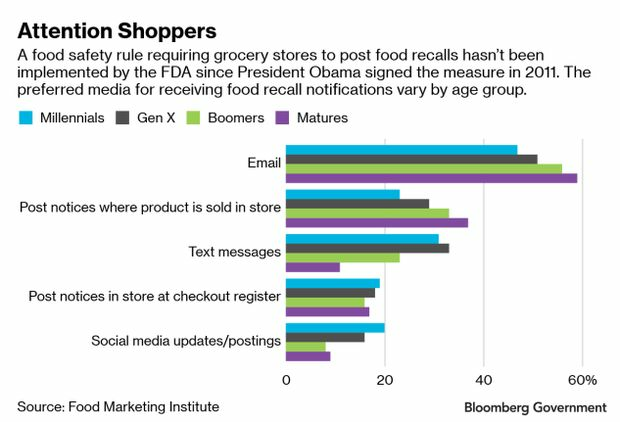 Consumer data collected by the Food Marketing Institute in a 2018 survey found 52 percent of grocery shoppers prefer recall information by email and 29 percent prefer grocers to post notices where the product is sold in the store. Other preferences were text messages, posting notices at checkout and notifications through a store’s phone app. The grocer provision offers many conspicuous location options for recall notifications and that “could be why FDA is dragging its feet on this,” said Thomas Gremillion, director of food policy at the Consumer Federation of America.